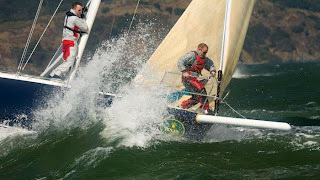 So, for you loyal blog followers, we have a bit of a sneak preview on two very exciting developments here at J World… First off, we will be offering classes from a THIRD San Francisco Bay Area sailing school location in the next month. Ok, it’s really more of an extension of our Alameda facility, but we are thrilled that we will be offering courses from the famous Jack London Square at the Oakland waterfront! 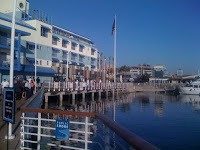 This hotel is front-and-center amidst the restaurants, shops, coffee houses, bookstores, and nightclubs… not to mention the great marina. 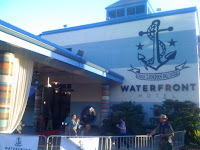 The Waterfront Plaza has just undergone a complete renovation, and is offering great room rates to all our students. We are excited to offer this new location to increase the sailing opportunities for our clients! So that’s one bit of news… and for the other bit, I am going to make you wait a couple of days… but you are going to like this one too! It’s a Peter Lyons shot, and he’s got a ton of great ones on his site. He really does a fantastic job… check out the sequence of the final run to the finish (including the luffing scenario I described in the last post) starting here. And do yourself a favor and hit his site at http://lyonsimaging.com/ for the full range of what he does. We are really fortunate to have him bouncing around the Bay with such regularity… not only does he have a great eye, but the guy seems to be EVERYWHERE, all the time! Thanks for the shots, Peter! Ok… the spray has settled and the wounds are healing. The muscles are not screaming anymore and the boats are rinsed off and back in their stables. 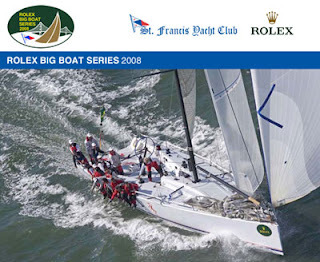 Congratulations to all the winners – and all the competitors – in the 2008 Rolex Big Boat Series in San Francisco. There were over 100 boats competing on the Bay last week, and J World was well represented. Congrats to Travis, who was aboard the winning boat in IRC Division C, Eugenie who was coaching the J/145 Raincloud to a fourth place overall in IRC Division B. Yours truly was skippering J World, our trusty J/120 to a third place in our class. I was lucky enough to have a great team that dragged me around the course and made things happen smoothly: from the left, Kevin, Ann, Rebeca, Taylor, Jeff, Chris, Andy, Paul, Adam, Patti, and Wayne… thank you for making this a great event. And thank you to the local J/120 Fleet… I have said repeatedly what a fantastic group this is. There is an absolutely unparalleled amount of camaraderie, healthy competition, and mutual respect with this group of sailors that presents such a refreshing change from the scenes and fleets that can devolve into petty and trivial squabbles. For example, the morning of the first race, one of the top competitors in the J/120 fleet (and a favorite to win the event) realized that in the chaos of getting ready, they had left their big class kite at home, with no chance of getting it before the start of Race 1. Two phone calls later, that team had two replacement sails to use from their competitors. Pretty cool. 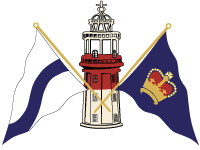 The group is incredibly welcoming to new fleet members… so if you are interested in checking out the group as either a potential skipper or a crew, I HIGHLY recommend it! So Magoo is winning the series, with Chance in second. To win, Chance would have to beat Magoo and put a boat between them in the last race. Well, for much of the race, we were that boat. Chance got out to an early lead, and we were able to sneak into second, but Magoo charged hard and pulled into third… and so it went with Chance holding us back, but not so far back that Magoo would get by, while Magoo slugged away at us. When our backstay ram got an air bubble in it and we started the last beat with no rig on, we got passed by Magoo and Grace Dances… bad news for Chance. And so at the final half of the final beat, we had a four way tacking duel…. we would tack, Grace would tack on us, Magoo would tack to keep Grace back, and Chance would tack to squash Magoo (remember, they had to push Magoo to third while keeping the lead). 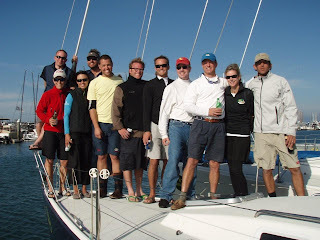 A recent graduate was good enough to post a bunch of pictues from his recent Learn-to-Sail class on San Francisco Bay… check them out here…. Thanks Roland! Well, no sooner has our trusty J/120 returned back from the 2008 Pacific Cup race to Hawaii and our offshore cruise back to California, than we are launching into another epic Race/Cruise combo! The mighty vessel J/World is in the yard right now getting all new standing rigging, and then she’s off to the races in the 2008 Rolex Big Boat Series. Right after this grand-prix event wraps up, all the comfort items get loaded aboard again and she goes into ‘cruising mode’ for the J World Annual Cruise to Mexico! This series of coastal/offshore cruising courses begins in mid October, and is one of our very favorite things we do. Each of the legs is a truly special adventure, and we even join in the world famous cruiser’s rally from San Diego to Cabo San Lucas… that’s right, you too can join the 2008 Baja-Ha-Ha!